This collection features Herbert West—Reanimator and several lurid tales of gore and grue such as The Lurking Fear, Pickman’s Model, The Horror at Red Hook and Under the Pyramids. 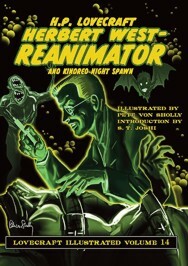 Herbert West—Reanimator (and Kindred Night Spawn). By H. P. Lovecraft, illustrated by Pete Von Sholly, introduction by S.T. Joshi. Hornsea, England: PS Publishing; 2017; ISBN 978-1-786360-97-7; jacketed hardcover.